Instant Imprints South Surrey, BC | Custom T-Shirts, Embroidery, Signs and More! At Instant Imprints South Surrey, our customers come to us when they want to be more visible to their customers. We create that visibility five different ways: Branded Apparel (embroidery), Signs & Banners, Promotional Products, Custom T-Shirts and Print Services. Amazed at the variety of product and the quality! I was not comfortable ordering these sorts of products online, the personal touch is very nice. Your branded promotional products represent your brand values as well as the quality of service that you provide. That’s why it’s important to get the best promotional products you can, with Instant Imprints in South Surrey! Whether your business is looking for custom t-shirts, printing services, promotional products, custom banners or branded embroidery items, our state-of-the-art production processes make sure that your end product is world-class. Combined with the personalized touch that your South Surrey Image Experts provide, you won’t find a better service for all of your print shop needs. Best of all, your project is handled from start to finish all under one roof, here in South Surrey! When you’re looking for the best print shop in BC, look no further than Instant Imprints in South Surrey. We have the tools you need to take your business to the next level, whether it’s through custom promotional products, printed goods or any of our other promotional offerings. We pride ourselves in completing your job on time or early, and getting it done right the first time. This helps you avoid those costly revisions that cut-rate print shops can provide. Get a global level of quality with a local South Surrey touch at Instant Imprints! Custom t-shirts are well known for being one of the most effective promotional tools out there. Customers or employees who sport your custom tees bring your logo with them wherever they go, showing off your brand with every step. Our custom t-shirt printing service has the latest in t-shirt tech, so you can use the design process which is right for your project. If you’re not sure whether to go with silk screen or one of our other design options, our South Surrey Image Experts are happy to help. If you’re looking for an even more special way of providing branded goods, our custom embroidery service can help you decorate virtually any form of garment. If you’re wondering, “Where can I create great custom t-shirts near me?” Look no further than Instant Imprints in South Surrey! When you want to stand above the competition, nothing beats a customized sign. Custom signs and banners bring your brand to the big leagues, helping you reach prospective customers from the sidewalk or the skyline. Our South Surrey Image Experts are happy to help you create the perfect sign for your next project announcement or event. 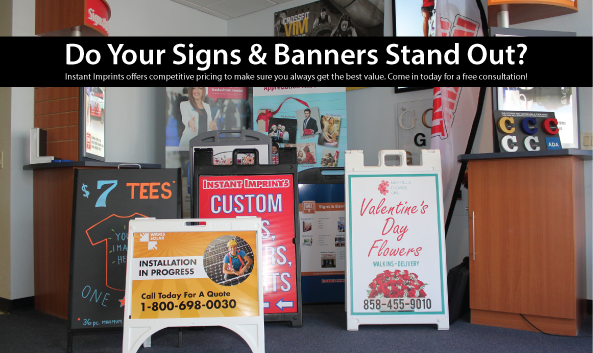 Custom banners are portable and durable ways to bring your message where it’s most effective. In addition, our personalized trade show displays can create a great talking point at your next conference. No matter what your promotional visions are, your local Instant Imprints in South Surrey can help you get the job done right. From start to finish, your project can be produced all under one roof, right here in South Surrey. Stop in at our Croydon Drive showroom, give us a call at (604) 541-0019 or request a quote online to get started today!